I've really been enjoying using my homemade organic toothpaste and decided to give two more recipes a-go. 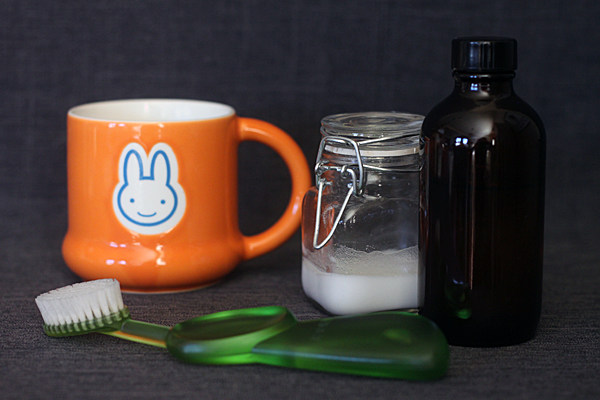 This time we're making two simple two-ingredient recipes, a whitening toothpaste and a minty mouthwash. DIY Simple Mouthwash: Mix 1/2 cup of distilled water with 3-10 drops of essential oil inside an amber glass. Shake before use. The more peppermint oil, the more intense it will be! The peppermint oil is antiseptic, numbs pain, and freshens your breath. You only need a small sip for your whole mouth. DIY Whitening Toothpaste: Mix 1.5 tablespoons of baking soda with 1 tablespoon 3% hydrogen peroxide and 5-10 drops of peppermint essential oil. Green stevia powder optional for sweetness. You won't taste the peroxide in this yummy fresh and minty toothpaste. It's fresh and minty and can dramatically whiten your teeth in one week to one month. I'd use this one to three days a week. Keep it in a glass jar because to accommodate expansion, I got my cute airtight lidded jar from Jo-Anne for 90 cents. Storage: I'd make the mouthwashes in small batches at a time to keep them at their freshest. You can store them in the fridge to extend their life, otherwise they'd last 3 weeks in a warm bathroom. Shake your mouthwashes before use, the lack of chemicals makes settling is normal. Have you tried any homemade toothpastes or mouthwashes? Let me know your experiences or if you have recipes to share. I've really been enjoying the toothpaste I made, in a couple of weeks my mouth feels cleaner and my teeth have whitened, too. I find them all at whole foods, but I included links to everywhere they can be bought online this time. Let me know how you like them when you try them! We've been enjoying them around here. I have tried my own toothpaste and I love it. I tried the addition of the hydrogen peroxide and it really helped, just make sure not to put it in a bottle that can't expand, as the hydrogen peroxide will make the bottle burst when it expands! One thing I found that just set it over the top is adding OraWellness Healthy Mouth Blend, which is a natural oil blend that is naturally antibacterial and also a mouthwash replacement as well. :) I make small batches and then use commercial toothpaste in between but my homemade stuff is definitely my preference!!! Thanks for sharing all the info Colby! I forgot to add that I got the cute air-tight lidded jar from Jo Anne's for 90 cents. I like how the OraWellness is a blend of lots of beneficial essential oils with some myrrh thrown in for good measure. Shoot i'm going to use a flask because one-now I got a reason to use one. Two-It cracks me up thinking everyone who goes to my bathroom will think I'm swilling the booze. Haha, yes, that perfection! :D You can actually mix vodka with essential oils for a mouth wash too so it's very appropriate. I chose not to because alcohol seems a little harsh and I hate the taste of vodka. Blech! That's basically the whitening toothpaste recipe shares today ;) Yum! Awesome to teach your students how to make their own, I used to love doing stuff like that in school most of all. I'm definitely trying the homemade toothpaste without the peppermint.My daughter is autistic and has a huge aversion to anything with mint in it which makes tooth brushing a daily battle.Maybe a few drops of lemon or orange oil instead? ?Would that work? Yep, that would definitely work. Orange oil toothpaste sounds amazingly delicious and it would be good for mouth health too. I stick to peppermint oil for my own because I'm obsessed with the mint plant and it's what most are used to. Easier to get someone to use a weirdo natural toothpaste when it tastes familiar. Whitening toothpaste can whiten teeth slightly by removing surface stains. We should use dental recommended whitening toothpaste brand. Wow, I never thought that homemade mouthwash/toothpaste is even possible. Thanks for sharing this super useful information, can't wait to try it this weekend! I've really been using my homemade organic toothpaste also and enjoying like you. Thanks for sharing this excellent review.